Happy Friday! I hope everyone has a relaxing weekend. Photo taken in the Okavango Delta, Botswana. 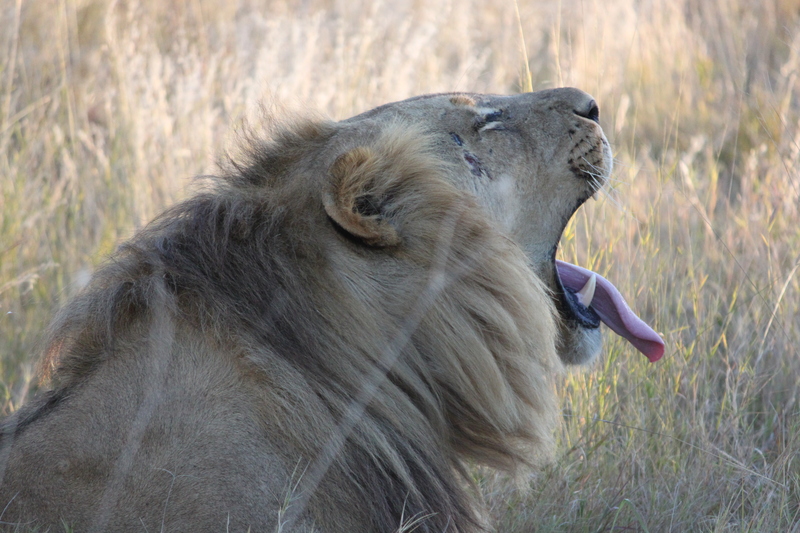 This entry was posted in Travel Photos and tagged 50 Year Project, Animal Photography, Animals, Blog, Blogging, Botswana, Fridays, Lions, Nature, Nature Photography, Okavango Delta, Photography, Photos, Travel, Travel Blog, Travel Journal, Travel Photo, Weekends. Bookmark the permalink. Fantastic photo, wish I could go to Botswana. Yikes! that would have been quite the hike. How many days did you hike there? That sounds amazing. We were there for three days only, but what a wonderful place! I’love to go back. I wish I could go back as well! I wish I looked that beautiful when I yawned. Looks like he’s ready for a good, long rest. Great shot! Yes we let him be. Not sure I want to be the one to disturb a napping lion. oh wow….your timing is so perfect! Thanks. Fortunately the camera can take several pictures at a time. Fighting a cold. Think I’m about ready for a nap! I’m like that every morning. I’m just not a morning person.